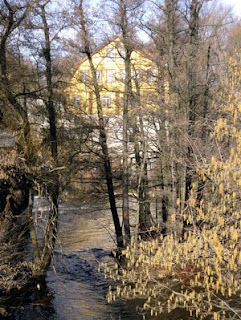 Behind the trees, you see a building from the early industrial history of Oslo. Hjula Væveri (weavery) was started in 1848, and moved into this wodden buildings by Beyer Bridge in 1855. The industry in this area along the river, goes much further back. The Papermill of Bentse Brug, was started already in 1687, and the Glads Mill, ran for almost 135 years, from 1736 until 1870. Now the red brick and wooden buildings along the river, has been turned into office space, restaurants, and exclusive appartments.